Perhaps you feel like you can operate just fine with only 5 or 6 hours of sleep a night, choosing to watch the TV instead of heading to bed. You may even feel that a lack of sleep is something to be “proud of” like a “badge of honour” and getting an early night is for “boring people”. Or you may be going to bed at “the right time” but still feeling exhausted in the mornings. Poor sleep has been shown to have a profound impact on our health and wellbeing. How Does A Lack Of Sleep Affect You? Studies have shown a lack of sleep can inhibit daily function and can have detrimental effects on your health and longevity including an increased risk of hypertension, diabetes, obesity, depression, and heart disease. Impair blood sugar levels and blood sugar regulation. Slow reaction time, increasing risk of accidents on the road and at work. Increase your risk of Type 2 Diabetes. Raise your stress hormone Cortisol which will decrease your immune function and increase your chances of infection or illness. Increase levels of other biomarkers related to fatigue, pain and poor health. In clinical practice I see first hand how a lack of sleep slows down my patients’ ability to physically repair from injury. I also see that a lack of sleep makes it much harder for my patients to lose weight, despite having good diets and also I see their blood test results show less than ideal results. How Much Sleep Should You Be Getting A Night? The amount of sleep we need varies throughout our lives. We need more as babies and children than we do as adults. But for the average adult we need 8 hours of sleep per night and if you lose sleep one night it is said that “catching up on your sleep” will not be enough. Not only do we need 8 hours of sleep a night but the time we go to bed has perhaps a more significant effect on our health. Throughout the day and night, certain hormones fluctuate depending on their role. Our stress hormone Cortisol will be higher throughout the day and lower in the night, whereas our sleep hormone Melatonin will be low throughout the day and higher in the evening and night time. 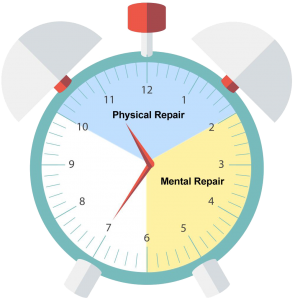 Between 10:00pm and 2:00am our bodies go through physical repair and between 2:00am and 6:00am our minds go through emotional/cognitive repair. Therefore if you are on average going to bed at 12:00am every night you are missing out on 2 hours of physical repair each night. You will be waking up feeling tired and in need of a coffee or energy drink or even worse, you may not realise how tired you actually are and think that it’s normal. Insomnia is the inability to fall asleep or stay asleep. If you suffer from insomnia you will know how incredibly frustrating it can be! The prevalence of insomnia is surprisingly common, with reports showing it affects 1-2 in 4 people but only 10% of those people end up seeking medical help. While there is no known identifiable cause of insomnia by itself, some known causes are certain medical disorders such as chronic pain, cardiovascular disease, thyroid dysfunction and some medications. If you’re waking up after a few hours of sleep and you’re unable to get back to sleep then this may be caused by something you ate earlier. Sugar, alcohol, spiced food and of course caffeinated drinks are often the culprits. If your blood sugar dips too low through the night this may cause you to abruptly wake up and struggle to fall back to sleep. If your levels of your stress hormone, cortisol, are too high at night you will have difficulties falling asleep and/or staying asleep. This is common in those with chronically high stress levels. Melatonin is your sleep hormone and it’s produced in the evenings as the sun starts setting. Bright lights, television screens, computer screens or phone screens in the evenings will all suppress the production of Melatonin. Insufficient intake of certain nutrients may also suppress the production of Melatonin. Using the principles of Functional Medicine we can assess your nutrition, lifestyle, hormones and stress to determine the best course of action for you. The good thing about this is that we take your whole lifestyle into consideration and look deeper into your routine, your diet or even your hormones. Following on from that we can then make some simple changes which will hopefully bring your body into a more natural sleeping pattern. Below are some of the ways we can assess your sleep to get an idea of what could be causing your insomnia. You can download sleep apps that measure your sleep. The ones that use heart rate will give you more accurate information. Ask your partner about your sleep. Are you holding your breath? Do you snore? We can assess a food diary to look for possible nutritional deficiencies or stimulants. A saliva cortisol test can measure your stress hormones throughout the day and can show you if your stress hormones fluctuate normally or not. If your sleep problems persist speak with your GP who may arrange for further investigations at a sleep clinic. Stop drinking stimulants (Tea, Coffee or Energy Drinks) by 3pm. Turn off the main lights and use small, soft glow lamps. Use blue light blocking glasses or turn on the blue light filter on your screens. Minimise TV and screen time if possible. Take a Magnesium Glycinate supplement or have an Epsom salt bath. Sleep in a slightly cool room or wear minimal nightwear. Sleep in a completely pitch black room. Use blackout blinds on your windows. *If you are going to bed late, around 11:30pm/12:00am then you will struggle falling asleep if you start going to bed at 9:30/10:00pm. Therefore we would recommend you make small changes over a period of weeks. Start by going to bed 15-20 minutes earlier than you normally would. Stick to this new time for a week or so until your body has gotten used to it. Then make another adjustment by 15-20 minutes for another week. Keep repeating this process until you hit the 9:30/10pm time. If you are struggling with your sleep and you would like further help then get in touch with us.